Our winter lead climbing course is for the competent and experienced winter mountaineer, who is looking to take his/her skills on graded winter routes. By the end of the course, you will have the tools to lead winter routes. The winter lead climbing course is 3 or 5 days long, and is run in the West Highlands, using Fort William as a base. The client-to-instructor ratio does not exceed 2:1, to ensure that we can give you our fullest attention. This course is suitable only for anyone with winter mountaineering experience, trad climbing experience would be beneficial, but not necessary. Bear in mind that winter conditions in the Scottish Highlands can be demanding, and a fair degree of fitness and determination would be beneficial. If in doubt about whether the course is suitable for you, please don’t hesitate to contact us. Each day of our winter lead climbing course, we would spend time assessing the weather, snow and avalanche conditions, in order to learn about safe route planning and detecting potential avalanche terrain. Guided winter climbing, usually a grade III/IV. Looking at rope and stance management, placement and removal of protection, and descent, which usually involves navigation. 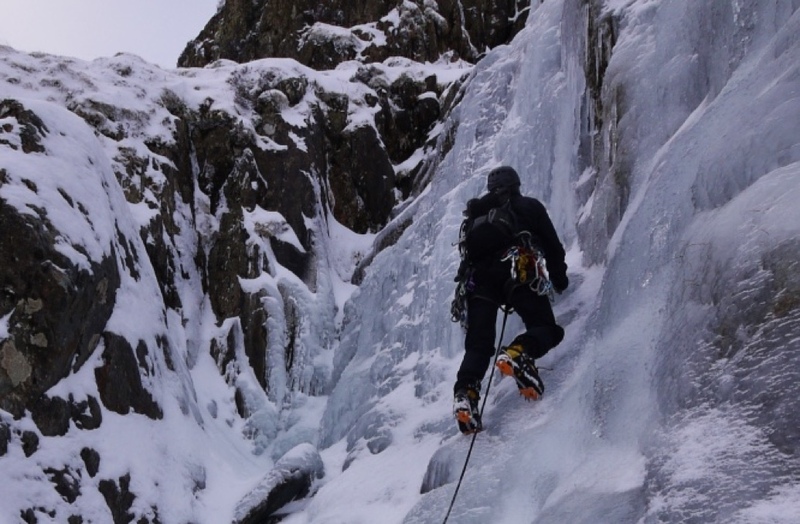 Introduce route selection and have a go at leading a grade II gully or ridge. We will be looking at placing protection, rope and belay stance management, abseiling using snow anchors, and navigating down a suitable descent route. Consolidate the skills learnt on the previous days. Take a more in depth look at route selection taking into account the avalanche/snow/ice conditions. Also looking at efficient movement on mixed terrain, and introduce ice climbing. Consolidate the skills learnt on the previous days. Look at placing pegs, abalakov threads and climbing a grade III/IV/V ice route. Looking at ice screw placements, ice belays and ice climbing techniques. Here we put all of the skills learnt on the previous days into practice, and allow you to take ownership of some/if not all of the day i.e. route selection (under our guidance), and if you feel confident lead a route within your ability. This is the day we take a backseat, and allow you to flourish into a confident winter lead climber. The course content and location tends to be dictated to us by the weather, so the winter lead climbing course layout can change. The 3-day Winter Lead Climbing course is a more condensed version of the above, but we strongly recommend 5 days, as there is a lot to cover. If you are unsure whether the winter lead climbing course is suitable for you, please do not hesitate to contact us on info@riseandsummit.co.uk or call us on 07775 853 348, and we would be happy to help.